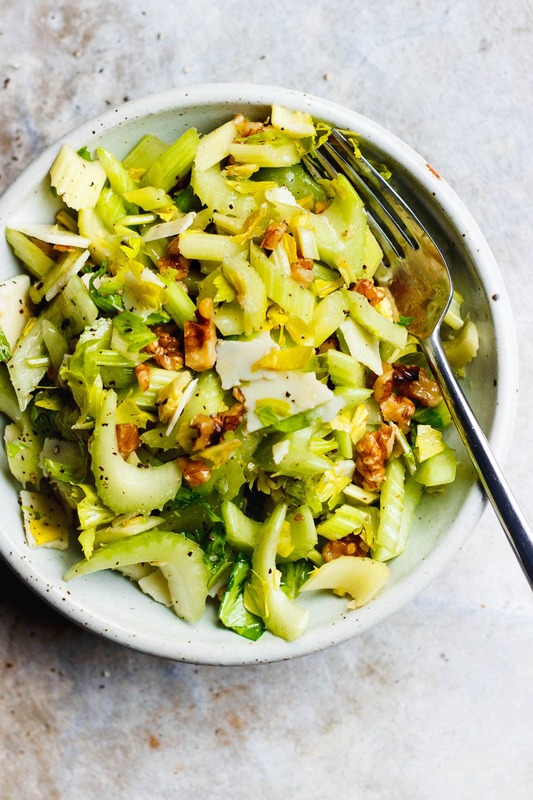 A salty, crunchy celery salad with parmigiano-reggiano and walnuts. 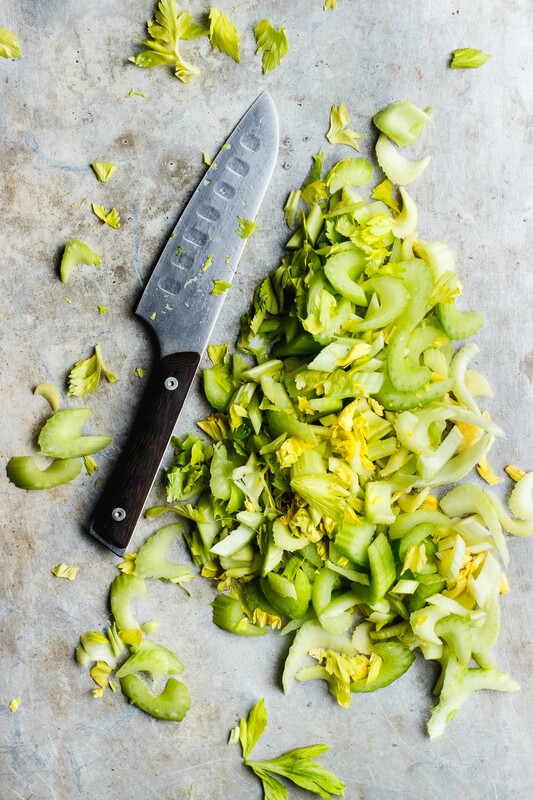 A classic, three-ingredient celery and parmesan cheese salad. 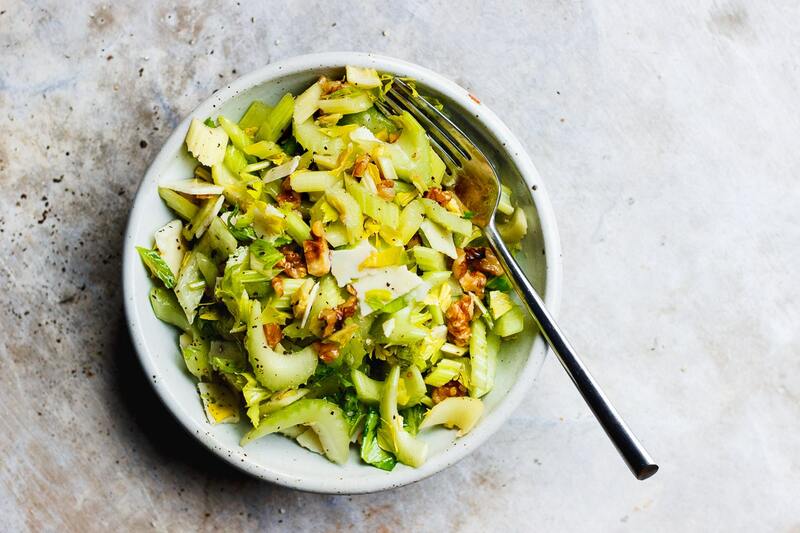 A three-ingredient celery salad with parmigiano-reggiano and walnuts. On each trip that we take back to Bologna. There’s a special place we go to when we land. Like, straight off the plane. It is always our first meal. It’s a small and unassuming place. And off the beaten path. Trattoria Mariposa is where you’ll find us. It has practically no online presence. And it packed nearly every minute it is open. I spend most of my days in the states daydreaming about my next meal there. They serve typical Bolognese food like tagliatelle alla bolognese, tortellini en brodo, lasagna verde, lambrusco, Parmigiano-Reggiano and mortadella. It is my heaven on earth. The second meal we have in Bologna is always a family dinner at our zia’s house. It usually consists of several, but small courses. And lots of wine. And a sweet treat ending. Starting with a simple salad, and then moving on with a bowl of tortellini en brodo. They even serve me hand-rolled gluten-free ones. Next, we’ll have grilled or roasted, and whatever is in season vegetables. Drizzled with an abundance of olive oil and balsamic vinegar. A then a cozy bowl of risotto or polenta. And then some cheese. And to finish, a small bowl of gelato. 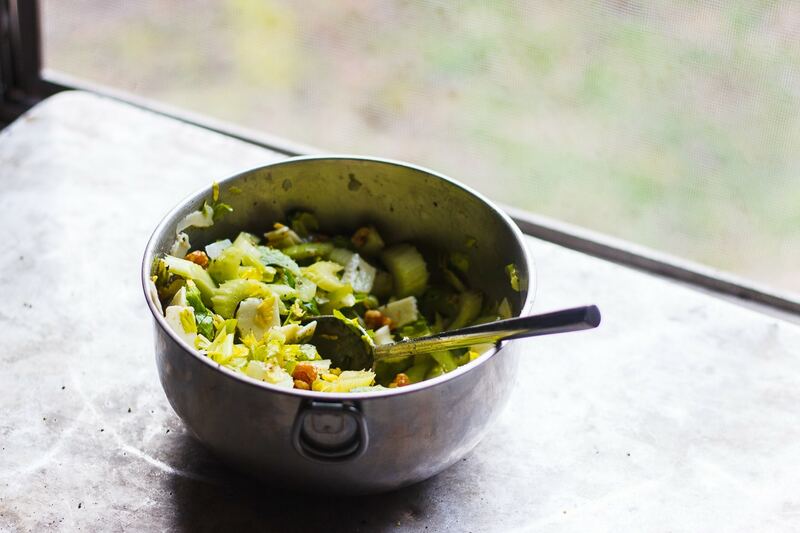 This past trip, our meal started with this celery salad. Just a few ingredients that sing together. 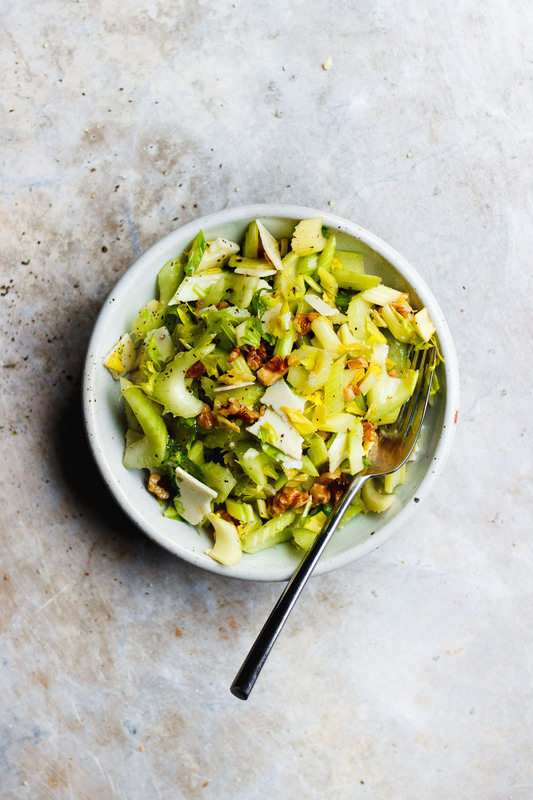 Celery, Parmigiano-Reggiano and walnuts. As usual, it was tossed heavily in olive oil and sprinkled generously with salt and pepper. It was crunchy and basic but anything but boring. Celery kept popping up everywhere we went on this trip. It was at all of the winter markets. And even though I’ve always been a big celery fan, it captured my heart all over again. Celery has a lot of natural umami. 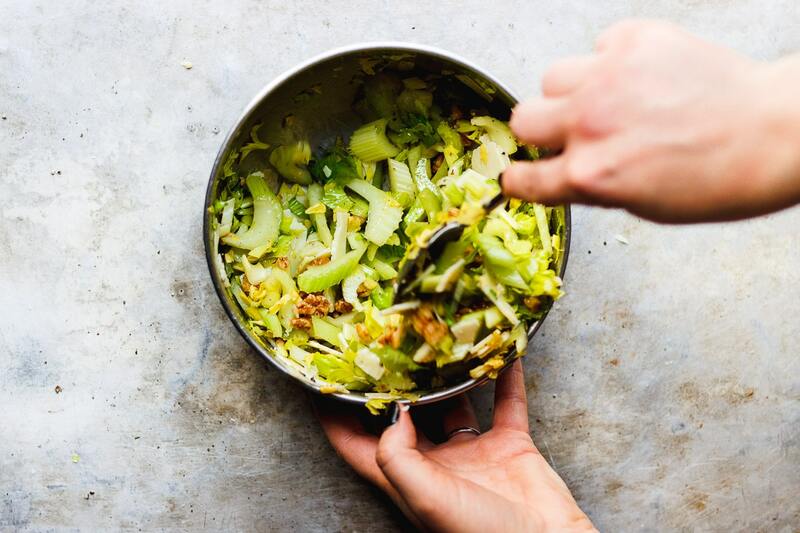 It can be a divisive vegetable, but I think when prepared right, it truly is the best. And while I’m typically not a fan of nuts in my salads, the walnuts balance out flavors beautifully. If you aren’t into nuts, or you are allergic, raw pumpkin seeds would work great. One thing you can’t really skip here though, is the cheese. This salad is all about the cheese. The king of cheeses for that matter. So a word about Parmigiano-Reggiano. A hard, salty unpasteurized cow’s milk cheese exclusively from the Emilia-Romanga region of Italy. The word, Parmesan is often used generically for various simulations of this cheese. And although it is not the same, you can use Parmigiano-Reggiano, Parmesan or Pecorino Romano interchangeably in this recipe. Whatever you find or prefer is okay with me. If you love celery as much as I do. Here are some of my favorite celery recipes from the archives. 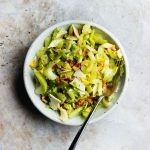 While I think this celery salad is best served right after it is mixed, you could make this ahead of time. Store it in an airtight container for up to 3 days. 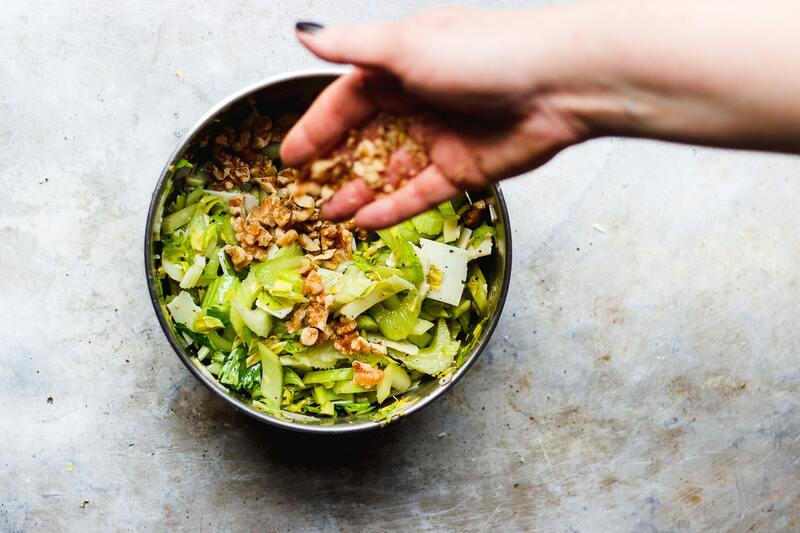 Toss together the celery, Parmigiano-Reggiano and walnuts in a mixing bowl. Then drizzle on the olive oil and vinegar and toss to combine. Parmigiano-Reggiano is a hard, salty unpasteurized cow's milk cheese exclusively from the Emilia-Romanga region of Italy. The word, Parmesan is often used generically for various simulations of this cheese. You can use Parmigiano-Reggiano, Parmesan or Pecorino Romano interchangeably in this recipe. If you are allergic to walnuts, raw pumpkin seeds would be a good alternative. So dreamy! I love hearing about your Italy adventures. And to tell the truth, I’ve never been a huge fan of celery-only salads, but the Parmigiano-Reggiano might just get me on this one, xo. Parmigiano-Reggiano is capable of a lot of things, xo! This sounds yummy delicious but I have apple cider and pomegranate vinegar. Could I substitute that in?